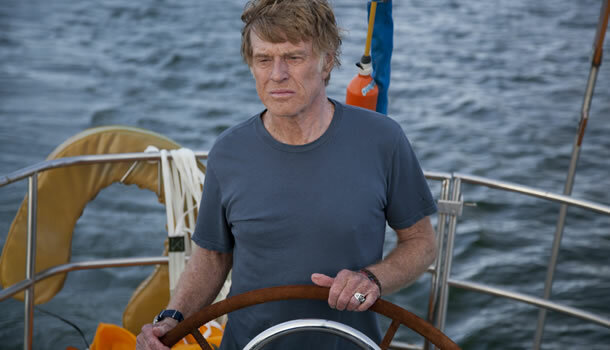 “ALL IS LOST” is a spare, minimalist movie about a man (Robert Redford in fine form) – a lone mariner, who is never named, on a well-equipped yacht, sailing solo from somewhere, we are never told where, to somewhere else – whose yacht, which presumably is all he owns, is irreparably damaged by an abandoned, half submerged container, absurdly filled with children’s sneakers. The movie is the story of his, often ingenious, increasingly desperate attempt to stay alive in the face of an implacable and relentlessly destructive ocean – a place of sun drenched calm, circling sharks and violent, battering storms. Despite the ghostly presence of a couple of freight-laden super-tankers, who remain oblivious to his presence, he is alone and adrift in a dark, hostile world, where there is no-one to reach out a helping hand. 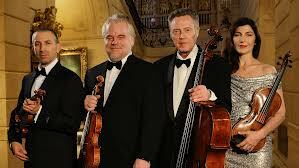 The movie offers us no back-story; there’s no attempt to endear us to Redford’s unnamed character. That’s not the point. All we know of him is what we’re allowed to see, so that we ‘know’ him not so much in terms of who he is, but what he does: a person who fights, through nous and determination, to stay alive. It’s as though director/writer (J.C.Chandler, who also gave us the gripping “Margin Call”) – is suggesting that his – Redford’s – back story is not simply unimportant, it’s a distraction. This isn’t so much about a character with whom we’re supposed to identify, it’s about an idea that is at the very heart of human existence – the drive to stay alive despite whatever odds life may throw at us: be that poverty, sickness, tragedy, loneliness, depression, or in this case, shipwreck. The movie asks us, at what point do you give up? At what point do you play the ultimate hand and stake everything on a throw of the dice, resigned thereafter to give in and sink into the void? To what extent do we need others, that helping hand, as a vital and necessary shoulder to lean on, without which there’s only chaos and darkness? The suggestion is that though for whatever reason, we may want to – or have to – go it alone, that way lies only madness and death. The movie plays with the audience beautifully: we’re one moment in the claustrophobic confines of the man’s life raft, in his head almost, closed in, zipped up against the torrent outside (perhaps this was how the man had dealt with the world – he had tried to simply be on his own and shut it out); the other moment we’re a distant observer, deep below the raft, a floating, lonely, fragile sphere of plastic – our earth? – encircled by a flow of passing, indifferent marine life. This is a movie of extraordinary and noticeable sound design. There are pretty much no words spoken (that would insert too much characterization and back story). 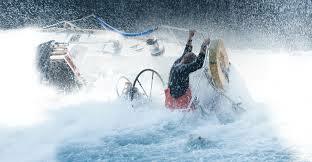 But, beyond the visual worlds we are made aware of: his world of the yacht/life-raft and the external, increasingly hostile world of the threatening sea and its rumble of storms, the director immerses us into an aural universe. The movie starts in darkness, and we’re introduced to the experience ahead via the sound of the waves lapping against the hull of a boat. It’s a gentle, almost soothing sound that belies the tragedy that has befallen the ship. As the story unfolds, the soundscape – the sound of the rain on his tarpaulin roof, the angry roar of the waves, the deep rumble of the passing tankers, the distant thunders of storms too far to see, but not too far to hear – give a life to the movie that takes the place of dialog. This is his conversation with the nature that he seeks to be a part of, but which seems set on ridding itself of him, an antibody that must be removed. And in the end his only conversation with this world is one loud, piercing “fuuuuuck”. Redford, now nearing 80 still looks good. He looks the part of the weather-beaten, capable ‘yachtie’. He’s always been an understated actor, not unlike Clint Eastwood, and here, he fights to stay alive not with thespian anguish and gritted teeth, but almost with a kind of stoic endurance. Like the movie itself, Redford’s acting is a wonderful piece of contained energy and quiet determination. THIS YEAR IN the movies, we were treated with many an example of brilliantly crafted, intelligent, well-acted, engaging stories. From stellar, big-ticket items such as “Lincoln” and “Django Unchained” to smaller, sparkling gems such as “Blue Jasmine” “Frances Ha” and “Nebraska”. The best of 2013 did what we’d expect all great movies to do: they were immersive and engaging, suspending our disbelief thru nuanced, nicely written characters, realized by extraordinary actors; with flawless production values that perfectly matched their narratives: stories that offered human insight and philosophical depth. And they managed to escape the dramatic influences that seem to be shaping much of movie making over the last few years. For we’re seeing two big trends, which are affecting how movie-makers – or the men with the money – are viewing their business: the decline in ticket sales and the lessening importance of the US market. Don’t get me wrong, the US remains a power-house in terms of movie revenues. But its relative strength is declining (down from 35% of total global revenues to about 30%; and that’s in value. When you consider that ticket prices are a lot cheaper in Latin America and China, the percentages show that the US now accounts for at most a half of global sales). More disturbingly, despite monster sellers such as “Iron Man 3” (with worldwide grosses of $1.2B), 2013 saw yet another decline in (US) ticket sales, which are now at their lowest number since 1995. So movie makers now have to be much more super-conscious of the international market, especially China, where movie-goers rose 35% in the last year, and they’ve got to find a way of arresting the declines – all of which are shaping movie content. Video Games are clearly a fundamental and increasing threat. These immersive, communal, stunningly produced interactive entertainments are drawing those 25 year olds away from the increasingly costly inconvenience of going to the theatre, to the warm comfort of their couches. Movie-goers have become gamers. 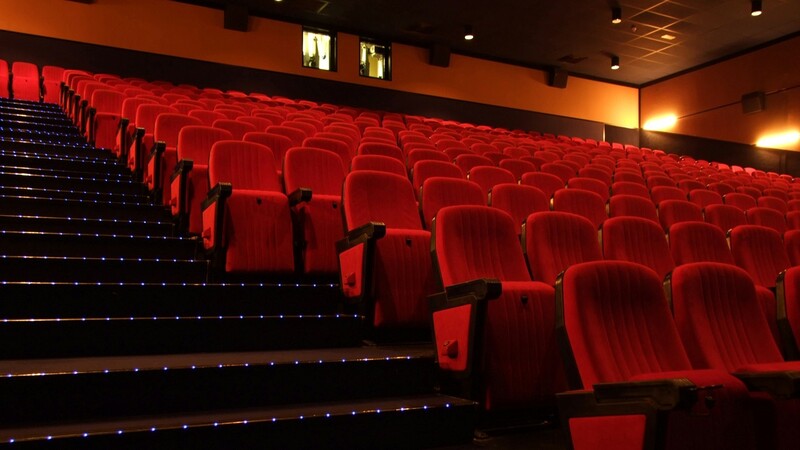 Only 10% of movie-goers account for 50% of the sales; and these are staying away in increasing numbers. 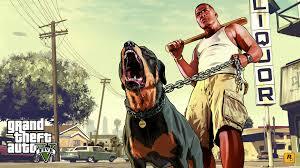 Indeed, look at the numbers: The Avengers took in $1B in 19 days; Grand Theft Auto V took in $800M in 24 hours! 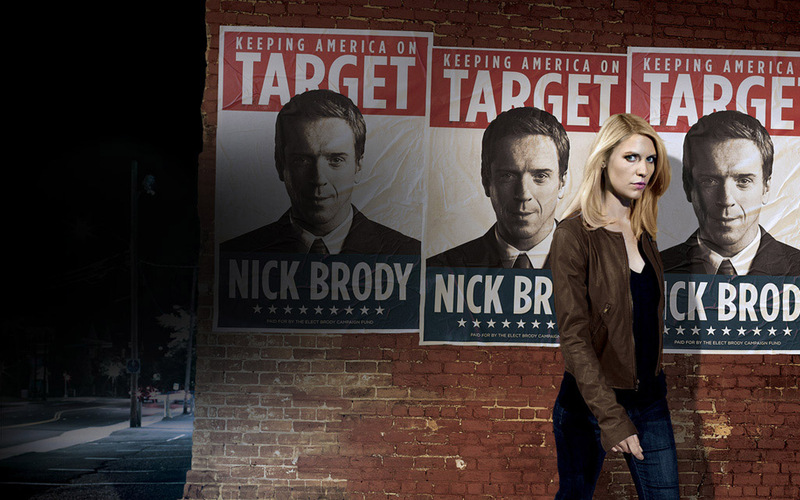 Fortunately, the dumbing down offered by video games is countered by the upsurge of stunningly executed TV dramas, driven by HBO, Showtime and a scatter of BBC and Nordic TV stations – from long form TV (those 8-12 week dramas such as “The Tunnel”, “Borgen” “Broadchurch” etc) to extended series such as “The Games of Thrones”, “Breaking Bad” and “Homeland”. The longer form of these intelligent dramas offer writers (or rather teams of writers) the opportunity to evolve characters, to allow plot asides that can explore multiple themes and issues, and to engage viewers with far greater resonance than, say the frothy content fillers such as “CSI” and “Two and a Half Men”. These dramas are as well-written as anything ‘quality’ movies have to offer; and with the likes of “…Thrones”, “Rome” and “The Tudors”, there’s no compromise in production values. Interestingly, the popularity of video games and the caliber of these dramas even seems to be affecting the caliber (and affordability) of our TV’s: the quality of the image we can now receive on TV equals pretty much anything the big screen can offer. So staying home is not a compromise to going out. And then of course, there’s On-Demand viewing. Viewers have been trained to expect to view content when they want, where they want. The need to schlepp out into the cold to the local cinema-plex for a 6.40 show feels almost analog in a digital age. And so, dear movies, quo vadis? Well, the first and most obvious movie counter move is what I’ll call the Video Game-ization of the movies. More and more, Hollywood is placing its bets on the attraction of 3D and on big, dumb, thuggish action shows to out-gun the appeal of “Warcraft”, “Grand Theft” etc. What “Pacific Rim”, “Iron Man 3”, “Olympus Has Fallen”, “Thor, The Dark World” etc have in common isn’t merely the number and intensity of explosions and violent car crashes, but in an overall dumbing down. There’s an increasing homogenization of the lead characters and a death of ‘real sounding’ people. The investment in big ticket superstars still seems to be a route to offering some sort of human dimension to the freneticism of action (which is why Robert Downey Jr is worth his salary, and which is why when producers cheap out on acting talent, as they did with “Pacific Rim”, there’s no talent to mask the inanity of the story). 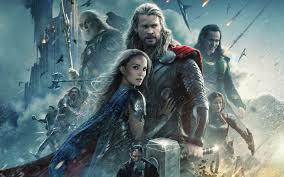 But it’s interesting to compare, say “Thor” (any of them will do) with, say “Independence Day”. The latter seem to have been filmed in a different era (as it was) when the director allowed (or was allowed) enough play in the story-line to offer viewers a cast of interesting characters. It wasn’t only Will Smith that ‘made’ this movie. Remember Jeff Goldblum’s nerdish scientist (the same part he played in “Jurassic Park”) or Judd Hirsch’s nebbish Jewish father or Harvey Fierstein’s fussy gay mother-dominated son or Randy Quaid’s drunk ex-Viet duster pilot? With “Thor”, we’re essentially treated to Chris Hemsworth’s muscles (One of the great discoveries in 2013 was “Rush” where we all learned that he can actually act and, say real words!). For, really, what else does a quasi video game movie need? But it’s important to segment Franchization into three ‘bits’: Moves such as “The Fast and the Furious” are simple repetitions of a formula set in different locations with marginal story changes. But movies such as the “Twilight” series, “Hunger Games”, the “Batman” trilogy, the “Bourne” trilogy etc. offer a slightly different twist on the franchise idea. In order to compete against the freedom of those “long-form TV shows”, we’re seeing more and more of these three and four part movie series. Some are simply really one movie drawn out into four, to maximize revenues – pretty much anything coming out of Middle Earth qualifies here – but many really do deliver powerfully in this longer form (the “Bourne” trilogy and “The Hunger Games” are the best of these, combining formidable acting talent, superb directing and cleverly crafted stories). The third ‘bit’ of Franchization may not look like a typical franchise, but it hews to the same formula: a story-line that everyone basically knows with more or less well-liked stars. And this is the rom-com: boy meets girl under generally weird circumstances; they fall in love after a certain amount of childish bickering; their fledgling romance is interrupted by an event or a person FROM THE PAST; once this barrier has been overcome, true and lasting romance blooms. You pretty much know what to expect. These low-brow romances seem to have inserted themselves into a niche that TV, with its insatiable programming demand for volumes of consistent content (hence the success of “Friends” etc), can’t compete against: one-off two hour dramas with pretty and bland superstars such as Katherine Heigl and (sadly) Jennifer Anniston crafted to satisfy a Saturday afternoon, pop corn girlie group hunger. Sadly, disasters such as “About Time” won’t dampen this flabby, sappy genre. At least those movies that fight against Video Games try to out-gun them on their terms: loud levels of visceral, dumb engagement. But there have been a few – disastrous – attempts to offer the same sort of exploding action sequences, but from a high concept perspective. It’s the Wall-E-iation of Sci Fi. “Oblivion” saw Tom Cruise emoting in that fake way of his in a failed attempt to inject some semblance of thought into video game action. The result was a disaster: “Oblivion” cost $120M to make (and probably another $50M to market) and earned a mere $90M in the US (But, to refer you to my point about the growth of the international markets, Tom’s more popular internationally, so there the movie earned a further $197M, which meant, in Hollywood terms, it barely broke even). Worse was Will Smith’s vanity project, “After Earth” which cost $120M to make and which raked in a poor $60M in the US (Like “Oblivion” the foreign market helped where it earned $180M). Hollywood’s fight-back against stronger TV offerings, Video Game thrills and on-demand video has resulted in its pretty successful courtship of the over 50’s, that under-served demo that it suddenly discovered a few years ago. From “The Best Exotic Marigold Hotel” to this years’ offerings of Dustin Hoffman’s unsuccessful “Quartet” and Yaron Ziberman’s excellent “A Late Quartet” and Nicole Holofcener’s outstanding “Enough Said” with its credible – yikes, older – lovers (Julia Louis-Dreyfus and the late James Gandolfini), there’s a whole new, albeit niche, market opening up, with great casts and good writing. Thanks Video Games for making this possible. Some movies are also beating the efficiencies of TV production costs and the thrills of video gaming by mass producing a growing list of schlock horrors that combine Franchization with cheapness: “Saw” “Paranormal Activity”, “The Final Destination” etc. The latest of the latter series cost $23M to make and yielded a gross return of $110M. This isn’t bad when you consider that these movies are in the volume business: churn ‘em out fast and cheap and reap the cumulative results. “The Final Destination” is interesting also from another dimension: its key director is Hong-Kong born James Wong. He represents the other trend that’s shaping the content of the movies nowadays: Sinization…or how much you need to cow tow to China’s censors to get your movie aired there. THE PROBLEM WITH picaresque stories like “The Hobbit: The Desolation of Smaug” is that there’s not much of a narrative arc. 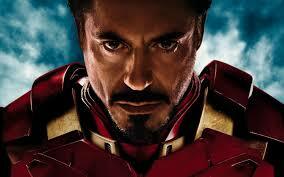 There is a lot of energy and loads of action, but the entire movie exists on one monotonous emotional level. Don’t expect much in terms of character development, story-line nuance or acting skills for that matter in this, Peter Jackson’s wearingly exhausting fifth version of Middle Earth and that damned ring. The basic story-line centers around the need for the leader of the band of dwarfs, Thorin Oakenshield (Richard Armitage, whose stellar CV includes masterpieces such as “Captain America: First Avenger” and various TV stints in “Spooks” and “Robin Hood”. This is an actor whose flaring nostrils and flashing eyes easily make him THE front- runner for the Rudolph Valentino award for swashbuckling excess) to steal a piece of bling – the Arkenstone – from Smaug, the dragon – a sort of reptilian wealth manager. 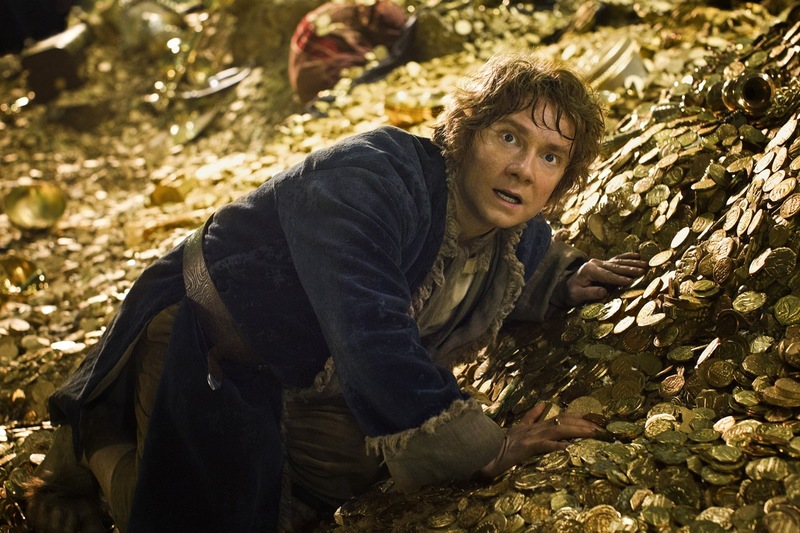 Bilbo, the eponymous hobbit (Martin Freeman, wearing an expression of permanent worry, as if his bonus were in jeopardy) is the one entrusted with stealing into the bejeweled lair (a glittering cave from “Beyond the Candelabra”) and filching the gem. Of course, Bilbo himself is enthralled with his own piece of bling – the famous ring – that gives him the power of invisibility, and like all wealth has the power to corrupt. Along the way, they are chased by elves, Orcs, sundry villagers and giant spiders. They run, they jump, the get caught, they escape, they get shot at and shot, they heal, they get chased again, they fight, they run, they swim…on and on and on for sixteen hours (OK, three). There are certainly some brilliantly executed set-pieces, particularly a spectacular fight against the giant spiders (though there’s not a lot of tension as to who’ll win – unlike, say “Game of Thrones” where all the good guys seem to get killed) and a marvelous river chase where Legolas (Orlando Bloom, still struggling for a place in the firmament of top ranked Hollywood stars) hops between barrels (in which various dwarves are riding), shooting sundry attacking Orcs. 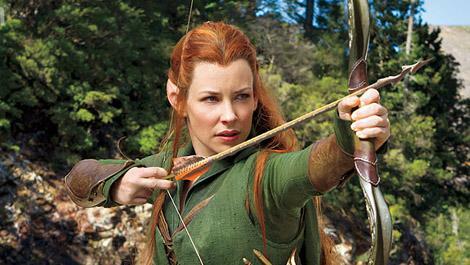 But we’ve seen it all before: in “Lord of the Rings” and “The Hobbit 1”. And we’ll see it all again in the multiple other versions of “The Hobbit” to follow. 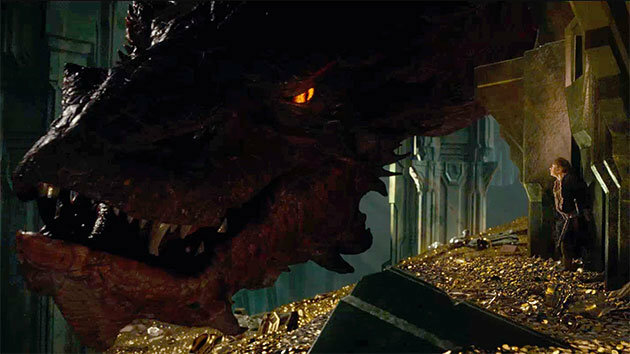 Certainly Smaug is a delightful dragon (Jackson’s beasts – Golum, King Kong, Smaug – are far more interesting than his humans) with Benedict Cumberbatch’s smooth, silky voice purring reptilian threat and dread. But beyond that, it’s business as usual: Gandalf (Ian McKellen) emotes as usual with full theatrical, thespian melodrama, and flits away from the chase for obscure reasons which will probably never be explained (or even if they were, they won’t really matter that much): there are the Disney-esque dwarfs who huff and puff and there’s the ethereally beautiful elf, Tauriel (Evalgeline Lilly, from “Lost”, who, though she really can’t act, we deserve to see more of), who struggles to balance love-lorn romance with Wonder Woman. And to think, we’ve not seen the last of this yet. THE SCENES OF the bleak, cloudy countryside we see of Nebraska in Alexander Payne’s marvelous, eponymous, film are images of emptiness, of wide open farmlands with still, unmoving cattle and un-working farm machinery, of mute silences and deep loneliness. This is the mind of its stubborn, obsessive, barely functioning, unfocused protagonist, Woody Grant (an outstanding Bruce Dern). The deluded Woody is deceived into believing he’s won a million dollars which he needs to collect in person in Lincoln, Nebraska. And so, motivated by his desire to use the money for a new truck and an air compressor (neither of which he has any need for), he sets out on foot to walk the eight hundred or so miles from his house in Billings, Montana. It’s his long walk for freedom; his, quixotic, quest to regain some semblance of self-respect, recognition and, as his faculties fail, dignity. 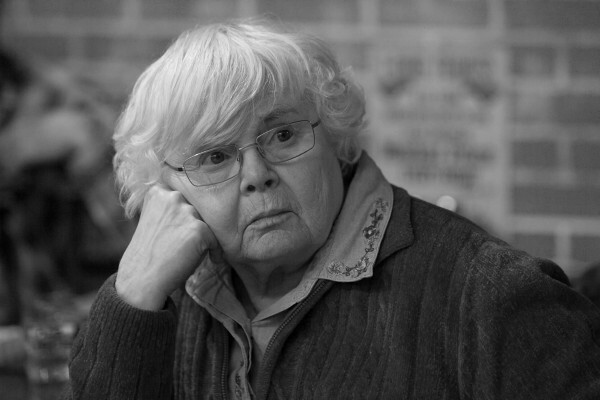 He’s also escaping his nagging, cantankerous, hectoring wife, Kate (June Squibb, better known for her appearances in “The Young And The Restless”) – a woman who has a nasty word to say about just about everyone she knows. Reluctantly, and also seeking escape from his own failed relationship and dead-end job, his son David (Will Forte, mainly from “SNL” and “Conan”) agrees to humor the old man and drive him to Lincoln. To mother and the successful brother, Ross (Robert Odenkirk from “Breaking Bad”), this is just a dumb trip that’s a simple waste of time and money. It’s a trip that takes them via Woody’s brother, Uncle Ray, still living -with his family- in the small, crumbling town that Woody grew up and worked in fourty years before. This is a town deserted by the young, where only the old timers (and Uncle Ray’s two overweight imbecilic sons) remain, creaking with memories and resentments, and narcotized by TV. Payne is unsentimental and unsparing about the old timers. There’s nothing charming and appealing about these country folk. They’re a bunch of judgmental, greedy hypocrites, who see in Woody’s quest, the potential for riches, diversion and a proximity to celebrity. Nebraska is, in its emptiness, more than Woody’s mental map. Perhaps, Payne suggests it’s also the moral map of the US. Bruce Dern pulls off a remarkable feat in his portrayal of Woody. His entire script probably covers no more than a few paragraphs. But we’re presented with a fully rounded, deeply flawed person who veers from semi catatonia to blinding and sarcastic clarity, from shuffling, physical frailty to steely determination, all with mere glances and mumbles. As the road trip unfolds, and Payne peels away into the dark side of rural Americana, he also slowly unveils, through flashes of illumination, Woody’s character and his past. And, along with his son, we get to know and gradually empathize with this befuddled drunk. For there is a basic honesty, an innocence and guilelessness to Woody that contrasts markedly with the relentless nastiness and dishonesty of his old hometown; indeed of the cause for the trip in the first place – that spurious ‘winning’ con. It is through Woody’s basic honesty that the director balances his cynicism (with the society and its mores) with a sense of optimism: as Woody’s immediate family are forced to close ranks against the overt and covert aggression of the small town, there is a rekindling of affection and love between the brothers (childishly stealing what they thought was the father’s long stolen air compressor) and between the long estranged parents. It’s as though, despite everything, that spark of decency we see in Woody and his son is enough to rekindle something positive, something good amidst all the bad. 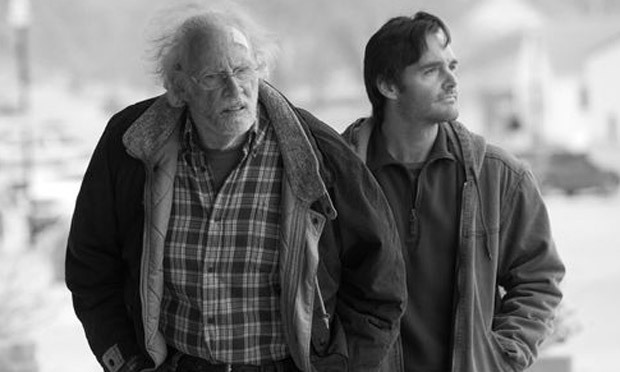 The mood of “Nebraska” is a lot more somber than Payne’s well-known recent productions: “The Descendants”, “Sideways” and “About Schmidt”. There is less of the witty satire that informed these three; his comic eye is less funny, more biting. But, as clear-sighted as ever.